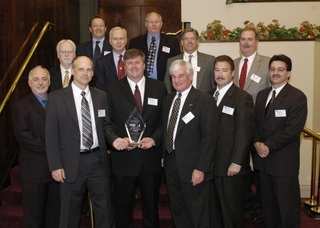 NEWPORT NEWS, Va., April 3, 2006 (PRIMEZONE) -- Northrop Grumman Corporation (NYSE:NOC) has received the Hampton Roads Project of the Year award for superior performance in implementing project management principles and techniques. The company's Newport News sector received the award from the Hampton Roads chapter of the Project Management Institute for successfully managing comprehensive maintenance of the nuclear-powered aircraft carrier USS George Washington (CVN 73), called a docking planned incremental availability (DPIA). Newport News implemented a number of best practices and unique teaming arrangements with the Navy to ensure a well-planned and executed program. The support, involvement and partnership with the Navy were critical to the joint success. In a nomination letter to the Project Management Institute, Capt. Garry White, the commanding officer of the USS George Washington, said, "The unprecedented communication and spirit of cooperation between the project team members led to all key events being meticulously executed. The entire crew of the USS George Washington was extremely satisfied with the quality of work and the relationship with Northrop Grumman Newport News and I could not have been more pleased with all aspects of this DPIA." The project lasted ten-and-a-half-months and included maintenance and modernization of more than 1,000 of the ship's compartments. The USS George Washington was re-delivered to the Navy on schedule and under budget. "The maintenance availability of the USS George Washington was a true project management success in every sense of the word," said Ken Mahler, vice president of aircraft carrier overhauls at Northrop Grumman Newport News. "This multi-million man-hour project brought together a diverse group of team members to accomplish a complex goal in which every key milestone was achieved and cost performance was exceptional as a result of strong teamwork and application of sound project management processes and tools." The Project Management Institute is the global advocacy organization for the project management profession. It is actively engaged in setting professional standards, conducting research and providing access to a wealth of information and resources. The purpose of the award is to recognize, honor and widely publicize project teams and sponsoring organizations for superior performance and execution of exemplary project management for projects. Northrop Grumman Newport News' Program Management Team for the USS George Washington maintenance availability received the Hampton Roads Project of the Year award for successfully managing the comprehensive project.